Atlantic Investment Management’s 13F portfolio value decreased from $596M to $381M. The number of positions increased from 20 to 22. Alex Roepers added DXC Technology and increased Oshkosh while decreasing Owens Illinois and Avnet. 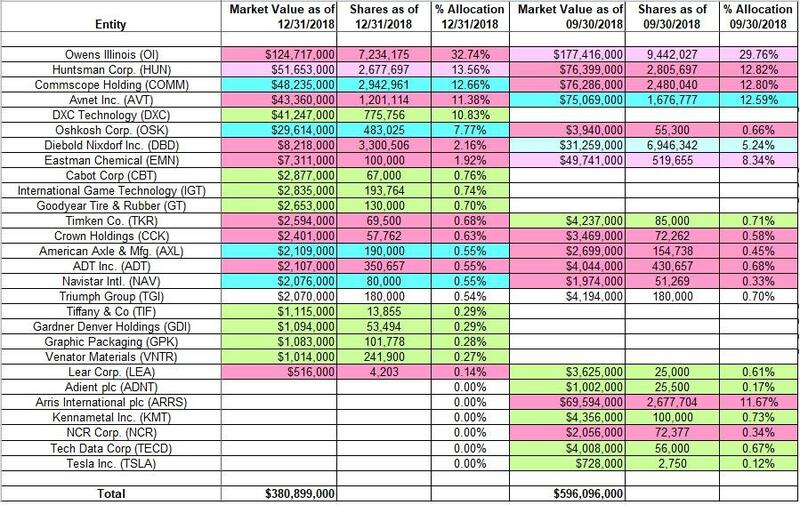 The top three positions are Owens Illinois, Huntsman Corp, and CommScope Holding, and they add up to ~60% of the portfolio. This article is part of a series that provides an ongoing analysis of the changes made to Alex Roepers’ 13F portfolio on a quarterly basis. It is based on Roepers’ regulatory 13F Form filed on 02/14/2019. Please visit our Tracking Alex Roepers’ Atlantic Investment Management Portfolio article for an idea on his investment philosophy and our last update for the fund’s moves during Q3 2018. This quarter, Roepers’ 13F portfolio value decreased ~36% from $596M to $381M. The number of holdings increased from 20 to 22. The top three holdings are at ~60% while the top five are at ~80% of the 13F assets: Owens Illinois, Huntsman Corporation, CommScope Holding, Avent Inc. and DXC Technology. Atlantic Investment Management’s annualized returns since the flagship fund’s inception in 1992 through 2017 was impressive at ~16%. Last two years, the fund has underperformed the S&P 500 Index. In a CNBC interview in May, Roepers mentioned that they are not interested in boardroom battles as they value staying liquid: ~20% of their historical returns can be traced back to active position-sizing around core stakes. To know more about activist investing, check out Deep Value: Why Activist Investors and Other Contrarians Battle for Control of Losing Corporations. ARRIS International plc (ARRS): A small ~1% portfolio stake in ARRS was purchased in Q4 2016. The following quarter saw a huge ~800% increase at prices between $25 and $31. There was another ~55% stake increase in Q2 2017 at prices between $25 and $30. The two quarters through Q1 2018 had seen a combined ~20% increase at prices between $23 and $30 while next quarter saw a ~16% selling at prices between $24 and $27.50. There was another one-third selling last quarter at prices between $23.50 and $26.75. The disposal this quarter was at prices between $22.50 and $31. In November, CommScope agreed to acquire ARRIS for $31.75 per share cash. Kennametal Inc. (KMT), Tech Data Corp. (TECD), Adient plc (ADNT), and Tesla Inc. (TSLA): These are very small (less than ~1% of the portfolio each) positions established last quarter but disposed this quarter. NCR Corporation (NCR): The minutely small 0.34% portfolio stake in NCR was established in Q4 2017 and disposed this quarter. DXC Technology (DXC): DXC is a large (top five) ~11% of the portfolio stake established this quarter at prices between $50 and $94 and the stock currently trades at $67.27. For investors attempting to follow, DXC is a good option to consider for further research. Cabot Corp. (CBT), International Game Technology (IGT), Goodyear Tire & Rubber (GT), Tiffany & Co. (TIF), Gardner Denver Holdings (GDI), Graphic Packaging (GPK), and Venator Materials (VNTR): These are very small (less than ~0.75% of the portfolio each) positions established this quarter. Note: GT has seen a previous successful roundtrip. A large position established in Q1 2013 was disposed in H1 2017 realizing large profits. Owens-Illinois (OI): OI is Roepers’ largest position at almost one-third of the 13F portfolio. It is a very long-term stake. In 2008, the position was minutely small and was built up to 11.2M shares by 2012 through consistent buying. It was sold down by ~40% the following year but was built back up to 12.2M shares in 2014 at prices between $24 and $35. Recent activity follow: Q1 2017 saw a ~17% increase at prices between $18 and $20.50 and that was followed with a ~40% selling over the next two quarters at prices between $20 and $25. There was a ~22% increase in Q1 2018 at prices between $21 and $23 and that was followed with a ~20% increase in Q2 2018 at prices between $16.50 and $22. The stock currently trades at $19.94. This quarter saw a ~23% selling at prices between $15.75 and $19.25. Their cost-basis on the remaining shares is ~$20 per share and the ownership stake is at ~4.5%. Note: In September, Roepers urged the company to sell its European businesses. They value that at between $3.2B and $3.8B. A sum-of-parts valuation would then yield a much higher figure than the current PPS. Huntsman Corp. (HUN): HUN is a large (top three) ~14% of the portfolio stake established in Q2 2017 at prices between $23 and $27. There was a ~20% selling the following quarter at prices between $25 and $29. The stock currently trades at $24.91. Last three quarters have seen a combined ~22% selling at prices between $18 and $33. Note: An all-stock merger with Clariant AG (OTCPK:CLZNY) was announced in May 2017, but the plans were dropped in October following activist pressure. Avnet Inc. (AVT): The AVT position saw a ~600% stake increase in Q2 2018 at prices between $38 and $43.50. That was followed with a stake doubling last quarter at prices between $43 and $49. This quarter saw an about turn: ~30% selling at prices between $34 and $45. The stock currently trades at $43.92 and it is a top-five position at ~11% of the portfolio. Diebold Nixdorf Inc. (DBD): DBD stake was established in Q3 2016. The following quarter saw the position built to a large stake at prices between $21 and $26. Recent activity follow: there was a ~16% selling in Q4 2017 at prices between $16.15 and $23.25 while next quarter there was a similar increase at prices between $14 and $19. This quarter saw a ~50% reduction at ~$4 per share. Their cost-basis on the remaining shares is ~$20 per share. Roepers realized losses. Note: In November 2017, a regulatory filing disclosed a letter sent to Diebold. It urged the then CEO to provide 2018 outlook and reaffirm 2020 target. The letter also suggested hiring a financial advisor to device strategic alternatives including buying back 20% of the outstanding shares without adding leverage (preferred converts). Eastman Chemical (EMN): EMN is a ~2% of the 13F portfolio stake established in Q4 2015 at prices between $65 and $74. It was a top five stake but has seen selling over the last two years. Recent activity follow: Q4 2017 saw an ~8% trimming and that was followed with a ~20% reduction next quarter at prices between $93.50 and $111. There was another ~40% selling in Q2 2018 at prices between $102 and $109. That was followed with an ~80% selling this quarter at prices between $68 and $97. The stock is now at $83.21. Roepers is harvesting gains. ADT Corp. (ADT) and Crown Holdings (CCK): These very small stakes (less than ~0.65% of the portfolio each) saw substantial selling this quarter. Timken Co. (TKR) and Lear Corp. (LEA): These very small (less than ~0.65% of the portfolio each) positions established last quarter were reduced this quarter. CommScope Holding (COMM): COMM stake was first purchased in Q2 2016. Q4 2016 saw a huge increase to a top-three portfolio stake at prices between $30 and $37.50. There was another ~20% increase in Q1 2017 at prices between $35 and $42. The position has since wavered. There was a ~45% selling in Q1 2018 at prices between $36.50 and $41 while next quarter there was a similar increase at prices between $27.50 and $41. Last quarter saw an ~18% selling at prices between $29 and $32 while this quarter there was a similar increase at prices between $15 and $31. The stock is now at $23.42. The position is very large (top three) at ~13% of the portfolio. Oshkosh Corp. (OSK): OSK was a minutely small ~0.65% portfolio stake as of last quarter. This quarter saw the position built up to a large ~8% stake at prices between $53 and $73. The stock currently trades above that range at $79.30. American Axle & Manufacturing (AXL) and Navistar International (NAV): These minutely small stakes (less than ~0.50% of the portfolio each) were increased this quarter. Triumph Group Inc. (TGI): TGI is now a very small 0.54% of the 13F portfolio position. It was established in Q4 2013 and a large stake was built over the next two quarters at prices between $61.50 and $79. The position had wavered, but in Q3 2016, it was still a very large ~11% portfolio stake. The four quarters through Q3 2017 saw the position almost sold out at prices between $20 and $34.50. The stock currently trades at ~$23. Disclosure: I am/we are long DBD, OI. I wrote this article myself, and it expresses my own opinions. I am not receiving compensation for it (other than from Seeking Alpha). I have no business relationship with any company whose stock is mentioned in this article.